Water in your home or office must be removed ASAP before mold and mildew begin to grow! It takes just 24 to 48 hours after water has penetrated walls and floor boards, before we can begin to detect mold or mildew. When you have a water loss, time is of the essence. Complete Clean Water Extraction has a crew standing by 24/7 to initiate the dry out process that is so critical. Call (210) 239-0486 for fast response. We offer comprehensive dry out services to cover all affected areas of your home. After utilizing our thermal imagining camera to detect all areas of water and moisture, our commercial grade water extraction equipment will remove up to 95% of the water in carpets and rugs, cleaning them in the process. At your option, we can treat carpets and rugs with a disinfectant to kill any fungi or bacteria that may be present. Carpets and rugs that have been wet for more than a few hours will begin to smell. Bacteria in the carpet can multiply rapidly and produce odors. At your option, we can apply a deodorizing agent that will destroy odor-causing bacteria, neutralize any pet odors, and leave the carpet smelling pleasantly fresh. Once standing water has been removed a room or basement will still be damp. Our drying techniques are unmatched among the competition. 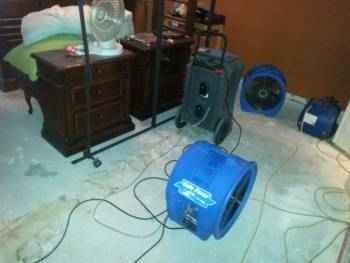 From our state of the art drying equipment, heat drying system, wall cavity Injectidry system, sub-surface drying equipment and our wood floor rescue drying systems, moisture is quickly drawn from carpet, tile floors and walls quickly and thoroughly.